This exercise was part of the EU FP7 Farhorizon Project which was aimed at piloting, developing and testing in real situations a foresight methodology designed to bring together key stakeholders to explore the longer term challenges that face their sector (or that cut across sectors) and to build a shared vision that could guide the development of the relevant European research agenda. This approach was applied to the theme “Teaching and Learning in an ICT Revolutionised Society”. The development of information and communication technology (ICT) in the last decades doubtlessly ranks amongst the major revolutions in our ability to communicate and to manage information. Over the last three decades, ICT has become a prominent feature of our everyday lives. The development of the personal computer and office productivity software in the eighties led to the widespread adoption of such technology in the business world. Similarly, the introduction of the worldwide web in the nineties and the falling cost of hardware brought computing to the masses and has led to the personal computer becoming a commonplace item in the domestic environment. The ICT revolution has resulted in a wealth of opportunity for increased competitiveness, innovative business models, government service delivery, new methods of learning and personal use. The European Commission has endeavoured to accelerate realisation of the benefits of ICT through a number of measures included in the i2010 Strategy (2005-2010) and more recently in the Digital Agenda 2020.
the economic rationale relates to the potential for increasing efficiency and effectiveness in economic activities, together with opportunities for developing innovative products and services based on advances in information technology. The “Success Scenario Approach” is an action-based approach where senior stakeholders develop a shared vision of what success in the area would look like, together with appropriate goals and indicators, which provide the starting point for developing a road-map to get there. The purpose of having such a vision of success is to set a ‘stretch target’ for all the stakeholders. The discussion and debate forming an integral part of the process leads to the development of mutual understanding and a common platform of knowledge that helps to align the actors for action. In practice, the structure of a workshop begins with a consideration of key drivers or challenges, builds a vision of success, and then focuses on actions to make the vision a reality. The workshop helps flagging hidden bottlenecks and constraints that might impede progress and facilitates identifying windows of opportunity for joint policy coordination and action. During the workshop experts from the domains of education and ICT met with policy-makers and other stakeholders to explore a foresight vision of the contributions that ICT could make in the areas of education, business, industry and society. The workshop also aimed to identify what measures would be necessary to develop the required skills. A number of meetings were held with the EU Commission’s Directorate General for Research & Innovation to establish the approach to be followed and to clarify the focus of the exercise. An initial description of the ecology was prepared as background for the workshop. The event was held in Brussels on 3 December, 2010 with the participation of 30 experts and policy-makers. The first part of the workshop focused on setting the scene and establishing the need for revitalised and coherent policy governance. A second session aimed at developing a common vision of the role of education in equipping European citizens with the skills needed in the coming decades. The third session sought to identify the key policies and instruments needed to achieve the vision, while the fourth involved prioritisation of the policy recommendations resulting from the earlier sessions. The fifth and final session focused on assessing ways in which key groups can shape the pace and direction of education in Europe. The workshop participants articulated a vision of a Europe where future generations possess an adequate repertoire of skills and competences to enable them to participate actively in a digital society, both in their personal and in their professional lives. Most of the younger generation, the so called digital natives, have grown up using technology that has now become an integral part of their everyday lives. This has imparted an easy familiarity and a sense of confidence in its use and above all a willingness to make use of such technology without a second thought. Nevertheless, their experience is largely based on using the technology for social networking and entertainment while their skills are at best incomplete in terms of exploiting ICT in other settings and in their professional lives. Similarly, the large-scale deployment of computers in business and industry over the last two decades resulted in significant segments of the workforce undergoing training or learning to use computers on the job. However, such training normally focused on specific applications rather than having a broad base of applicability, hereby limiting the ability of such individuals to fully exploit the potential of ICT. In spite of such business-driven learning, however, there still remains a significant sector of the working population which has not yet had the opportunity or taken the initiative to develop digital competencies, severely limiting their professional development and career options. Other sectors of the population, such as those not in active employment and the underprivileged, have had limited opportunity to learn to use ICT. The level of utilisation of ICT as a tool in education remains low overall, and there is lack of a common approach across the EU as well as within individual countries. While most schools are now equipped with computers, Internet access and occasionally more sophisticated equipment such as interactive whiteboards, effective eLearning requires far more than the mere introduction of hardware in the classroom. In general, however, schools have failed to develop visions and strategies on the way they can integrate e-learning effectively throughout the curriculum and in the school environment. Teacher training on the use and role of ICT in learning has not been adequately addressed, and exploitation of ICT by and large has been left up to the initiative of individual teachers. In most cases, school curricula have not been adequately updated to take into account the needs for developing ICT skills. ICT offers the opportunity of a superior learning experience through the use of multimedia, specialised software and educational games. However, established textbook publishers have largely failed to embrace ICT and to develop teaching material incorporating simulations, games and other modern tools. Although much educational content has been developed, the lack of a recognised certification mechanism means that most educational institutions are unable to make use of this material. Some countries have recently embarked on the development of libraries of ICT material (Wikiwijs Netherlands, KlasCement Belgie). Most EU countries have introduced a number of campaigns and schemes aimed at improving the ICT skills of the elderly, the underprivileged and the marginalised. However, sustained effort for this target population is required and adequate opportunities should be made available for all members of society to have access to the Internet, to master the necessary skills, and to benefit from modern technological developments. The workshop participants articulated a vision of a Europe where future generations possess an adequate repertoire of skills and competences to enable them to participate actively in a digital society, both in their personal as well as in their professional lives. European educational systems need to take advantage of improved learning mechanisms offered by ICT, and individuals must be able to manoeuvre safely in the virtual world whilst being creative and constructive contributors to society and to our economy. Europe must produce a cadre of workers who are able to leverage the power of ICT to enhance their productivity, to develop improved products and processes, and to reap social and economic benefits through the development of innovative solutions. In order to achieve this vision, the following policy recommendations have been put forward. The participants supported the idea of a high-level initiative driven by the European Commission and synergising policies of other policy domains, such as innovation and industrial policy. An analogy was drawn with the Commission’s approach to innovation, a successful horizontal initiative cutting across several organisational structures. The education initiative must be moved to a prominent position on the political agenda and should be given a high profile and strongly promoted to raise awareness among the public and stakeholders at all levels. It must be underpinned by the development of a roadmap establishing targets and lines of action while emphasising the imperative rationales (economic, social and vocational) without discouraging pedagogically driven activities. Evidence-based policy development was also mentioned as one of the criteria. It was also suggested to promote the use of structural funds and other sources of funding, such as the European Competitiveness and Innovation Framework Programme, to finance the initiatives referred to above. Participants discussed various approaches towards monitoring progress in the area of ICT in education and agreed that indicators currently in use need to be reexamined. For instance, the ratio of students to computers is not a meaningful metric on its own and needs to be supplemented with measures of frequency of use, teacher skills, and use of educational software amongst others. Monitoring of progress should be complemented by tools of trust including information on available instruments, good practice and success stories. Defining references for ICT competencies, in relation to the self-learning potential and ICT applications in society, for different levels and types of schools, subjects and disciplines, and in regard to future fields of employment was also supported. Action is needed to stimulate national and international networks of stakeholders to unlock resources and to exchange experience and good practice between all stakeholders to include discussion of policies, foresight and research outcomes. Governments should work with hardware suppliers and use procurement power to stimulate the development of well-specified state of the art, schoolproof, low-cost hardware to enable each student to have his or her own tablet. The educational system plays a pivotal role in preparing future generations with the skills they need for a fulfilling career, including ICT. Despite some progress in educational systems towards meeting this goal, much remains to be done. The scale of change that is needed calls for a concerted effort to implement changes at various levels before the educational system can be deemed to have reached a satisfactory standard. University training courses for new teachers urgently need to address the pedagogical dimension by including instruction in modern teaching methods, exploiting ICT hardware and software to provide a superior educational experience to students. This needs to be complemented with specialised courses for existing teachers in order to reach the entire teaching workforce. There is a growing understanding that kids do not automatically attain the required skills. Curricula need to be updated and should include ICT literacy. ICT applications should be integrated in subject and disciplinary learning, and opportunities for self-learning through the use of ICT should be promoted and exploited. Research and pilot studies need to be undertaken to obtain a better understanding of how teaching methods can be improved. Educational materials need to be digitalised and improved, and textbooks must be complemented by courseware based on rich multimedia and incorporating graphical simulation and educational games. Educational material providers need to engage in dialogue with schools and may require encouragement to invest in the development of such materials. Networks of stakeholders (such as schoolnet) provide an opportunity for mutual learning and exchange of good practice, and such initiatives should be further encouraged and broadened to include discussion of policies, foresight and research outcomes. At the higher education levels, ICT should be incorporated into other disciplines (e.g. medicine, social sciences) whenever possible. Students should be given greater freedom of choice in selecting study modules – this should promote creativity and allow students to build on their strengths. While many workers have been trained or have developed computer skills on the job, there still remains a significant sector of the working population which has not yet had the opportunity or taken the initiative to develop digital competencies. This reduces their career prospects and negatively impacts the competitiveness of the workforce. Participants supported the lifelong learning paradigm and the idea that public and private employers should introduce programmes to enable their employees to develop the necessary competencies. One way to encourage this would be through the use of financial instruments such as tax incentives, subsidies and grant schemes funded by central government. However, merely addressing digital literacy skills in individuals is not sufficient. ICT presents myriad opportunities for productivity gains and competitive advantages in business and industry, and a more elaborate approach is called for. Tailor-made, sector-specific workshops should be organised with the objective of enabling employees to discuss how ICT can contribute to innovation within their particular sphere. The participants identified the need for specific schemes targeted at adults who are not in productive employment to catalyse them into embracing modern technology. A favourable environment must be put in place to provide an opportunity for all members of society including the elderly, the underprivileged and the marginalised to form part of the information society. Sustained efforts to promote broadband and drive down the costs of computers and Internet access are needed to facilitate availability for those requiring it for their personal use. Free courses on basic use of computers and the Internet will also help. These sectors may need special encouragement to help them overcome the initial apprehension of dealing with technology. Multipliers such as social workers, carers, and others who are in direct contact with these individuals can be instrumental in informing them about opportunities and encouraging uptake. These workers should be provided with specialised training in this area, and their institutions should be provided with the equipment needed. Creative solutions should be encouraged where institutions such as schools, libraries and local community houses are aligned to raise the level of ICT awareness and literacy in deprived regions and neighbourhoods. European Commission [EC] (2010), Europe’s Digital Competitiveness Report 2010, SEC(2010) 627, DG INFSO, EC. European Commission [EC] (2009), Indicators on ICT in Primary and Secondary Education, October 2009, DG EAC, EC. 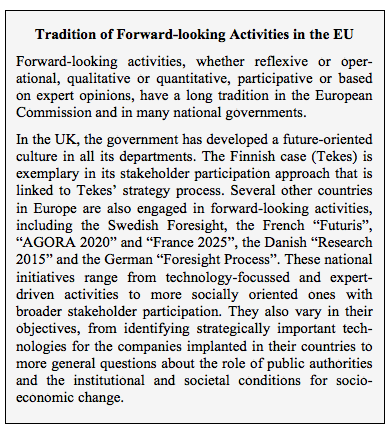 European Commission [EC] (2010), Annual Information Society Report 2009 Benchmarking i2010: Trends and Main Achievements, COM(2009) 1103. With creativity and strategy, the CReATE project designed and implemented a novel strategic cluster development approach integrating Strategic Policy Intelligence tools (such as foresight and impact assessment) and direct innovation support instruments. Guided by a trans-regional framework and based on very different regional strengths and research, technology development and innovation (RTDI) support histories, it aimed at fostering cross-cluster and transregional learning and knowledge exchange more effectively and successfully. In an iterative process, alternating between and mutually enriching the regional and the trans-regional levels, research priorities for information and communication technology innovations in “Culture and Creative Industries” were identified. Strongly related to their “fields of excellence & fields of aspiration” (the existing strengths but also the future development trajectories set by the regional stakeholders), the strategic capabilities of the different stakeholder groups were strengthened and a strategic joint research agenda was developed. On this base, broader and more far-reaching activities will be developed regionally and trans-regionally, also involving partners from outside the consortium and optimising regional, national and EU programmes from RTDI and other policy fields. To emerge invigorated from the current economic crisis is the most important challenge for the European economies, societies, policies and the European Union as a whole. New sources of sustainable growth must be tapped, creating new jobs and markets for European citizens and companies. It is of strategic importance to better harness the potential of innovation and knowledge cutting across and connecting all sectors, and to better coordinate priority setting and programme design between regional, national and EU levels in order to tap synergies of actions and policies. In this respect, the Culture and Creative Industries (CI) based on state-of-the-art information and communication technologies (ICT) play a strategic role. The CI sector is one of the emerging lead markets of the European knowledge economy, already ranks fourth in EU GDP contribution (626 bn € in 2007). As ICT constitute the technology base enabling the development of innovative CI products and services, research progress in ICT is a key ingredient for sustaining competitive CI. Therefore, it is a good investment to support ICT research and to encourage a more systematic and forward-looking use of its innovation potential. To fully harness this potential, it is important to develop new strategic guidance and RTDI support schemes, as the CI sector is characterised by a comparatively high percentage of micro-enterprises and non-conventional forms of employment. The CI employment growth rate has been double that of the general economy in recent years and is forecast to continue at an average of 10 % annually. Cooperation with CI enterprises increases the innovativeness in all sectors, and regional CI specialisation explains about half of the variance of GDP/capita. Efficient knowledge generation and its creative application can transform the traditional industrial landscape into a competitive industry base and modern service sector, thus contributing to the generation of new markets and high-quality jobs. In its EU 2020 proposal to the Council in March 2010, the European Commission highlights the importance of creativity and knowledge creation for sustained and sustainable growth. It aims at an impetus for overcoming the current crisis and advocates a new approach that explicitly addresses the complex interdependence between all governance levels. Often, the main challenge for effective decision-making is the distributed nature of knowledge. SPI tools provide public and private decision-makers with comprehensive, objective, and forward-looking information (e.g. on long-term developments, global trends, societal and individual values, etc). Applied consecutively and consistently, they can help identify, select, structure and ‘translate’ all available information, thereby enabling the development of better decisions and policies. The concept of a simplified policy support cycle (see graph) can help take this better into account for improving policies and programmes. It facilitates the analyses of decision-making processes and identifies the tools necessary to optimise the outcomes at each stage. Strategic policy intelligence (SPI) tools include technology or territorial foresight, innovation and technology assessment, roadmapping, evaluations and other interactive exercises. Building on these concepts, the CReATE project (Creating a Joint Research Agenda for Promoting ICT Innovations in CI across Europe) developed a novel approach for enhanced strategic, trans-regional cluster development. Mobilising the commitment of and supporting consensus-building among all relevant stakeholders, project activities included trans-regional vision-building, priority-setting, project development and programme coordination across CI clusters in Baden-Württemberg (DE), Piemonte (IT), Rhône-Alpes (FR) and West-Midlands (UK). CReATE was co-funded by the EU “Regions of Knowledge” (RoK) initiative, which aims to strengthen the research potential of European regions by encouraging and supporting the development of regional research-driven clusters. The seven project partners, including public authorities, cluster managing organisations, technology transfer and research organisations, aim to increase CI competitiveness, market potential and outreach to other industry sectors by making more systematic use of ICT’s innovation potential. 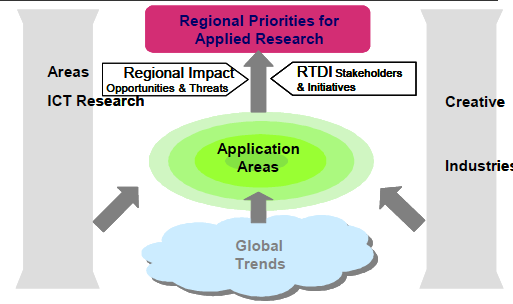 To make the best use of their different RTDI support histories (EU, national, regional), factor and demand conditions, and strengths in the CI field, the partners worked with a common methodology (developed in an earlier RoK project) towards common overall priorities – and, on this base, developed different, regionally optimised applications. SPI tools were applied to identify promising RTDI priorities as a key ingredient of sustainable cluster growth, to foster trans-regional knowledge exchange more effectively and successfully, and to optimise the use of regional, national and EU infrastructures and programmes. architecture, visual arts and design. 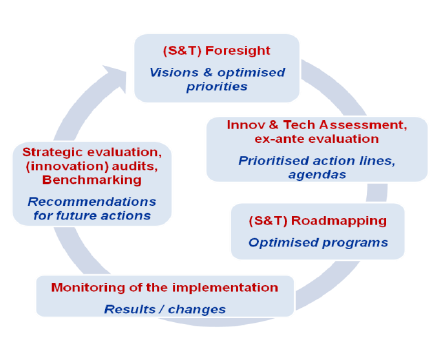 Based on a methodology developed in the earlier RoK project RegStrat (SPI Tools for Better S&T Investment Strategies in Europe’s Regions) and the policy support cycle shown above, several SPI tools were applied: innovation analyses and benchmarking were followed by foresight-type and impact assessment activities and resulted in recommendations for joint projects and for optimising RTDI programmes. The recommendations were adapted to the specific needs and policy objectives of the participating regions. To ensure both regional and trans-regional impact, the overall process was designed in an iterative way, alternating between and mutually enriching the different governance levels. As a sound basis for the analysis of the state of play regarding the regional CI and ICT research potential and the identification of regional ‘fields of aspiration’, a background paper described general future trends and drivers in ICT research relevant for the application in CI. Based on this and the regional analysis template prepared by the strategy consultants of Steinbeis-Europa-Zentrum (SEZ), each region conducted stakeholder interviews and desk research to elaborate a comprehensive set of data and information on CI and ICT innovations. These regional knowledge-generating activities resulted in comprehensive regional reports including cluster maps and detailed SWOT-analyses. Prospective activities were undertaken in form of two workshops in each region, designed and supported by foresight consultants to ensure adequate and comparable results. The first regional stakeholder workshop elaborated a common perception of important trends and drivers of possible future developments in CI. Then, key opportunities and challenges to be faced with regard to the regional strengths and weaknesses from the previous SWOT analysis were identified. The second workshop developed a shared understanding of the possibilities arising from ICT RTDI for CI and derived a ‘ranking’ of regional research priority areas. Based on the regional results, the identified ICT research capacities, the CI needs and the defined research priorities were related to each other, and joint priorities relevant to all project regions were identified. These were discussed with regional stakeholders and EU representatives during an international IC conference in Turin. Visual and Interactive Experience: new visual dimensions and digital interaction between humans and computers (3D internet, virtual worlds, simulations and computer-generated imagery). Tools of Productivity and Intelligent Automation: improved productivity and semantic software (rapid prototyping, conversion of 2D visualisations to 3D, more precise combination of web and database content). Digital Distribution: new distribution channels on the World Wide Web (collective availability of user-generated content, new markets and revenue streams). Mobility and Interoperability: a new level of flexibility in the mobile age (any time, any place access to information, location-related and personalised mobile services). User-Producer Interaction in Development: new production methods featuring user-generated content. The JRA was based on a trans-regional analysis (‘match-making’) and enriched by input and feedback from regional stakeholders. It includes an outline of the current situation as well as future development perspectives, strategic research areas for CI and, more specifically, a comprehensive depiction of the CReATE transregional research priorities. Future lines of action and promising implementation activities for the CReATE and other regions were also outlined. In line with this, the project partners and relevant stakeholders formulated promising cross-regional, cross-cluster project ideas and concepts. Feasibility and relevant funding opportunities were also scrutinized. The implementation of these project ideas is not part of the CReATE project. However, as it plays a vital role for the sustainable impact of the whole process, the regional project partners aim to support and encourage regional stakeholders to continue the work in this sense. Also, the strategic CReATE results were designed in a way that they could be utilised in the medium-term for broader and long-term trans-regional cooperation and for the purpose of optimising regional research programmes and policy development more generally. The European outreach of the project was addressed by transforming the project methodology and good practices from the partner regions into a generally applicable and easy-to-use toolkit for all European actors. Furthermore, the know-how gained during the project served as input to interactive training and capability-building workshops for interested regions. By June 2010, two of these will have been conducted in the greater Dublin region and Pomerania, Poland. Even after the end of the project, such workshops can be set up in other regions interested in strategic cluster development. CI play an important role in economic growth, both in terms of the sector’s own contribution to GDP and its role in the innovativeness of other economic sectors. Supporting CI clusters in Europe’s regions can thus considerably contribute, directly and indirectly, to regional, national and European competitiveness. Higher, better coordinated and more focused RTDI investments can be achieved if sector or cluster priorities are set based on a broad forward-looking perspective considering future technological, social and political developments on the local and global level. Thus, future projects, programmes and policies need to focus on how to achieve the agreed direction or facilitate the desired change of direction. Success means that activities are designed and conducted not only aiming “to do things right” but rather “to do the right things right”. Therefore, strategic guidance, as developed and implemented in the holistic three-stage SPI-supported CReATE approach, will become increasingly important for the long-term economic success of research-driven clusters. CReATE’s intertwined bottom-up and top-down approach, enhancing cooperation on various levels and between a variety of actors, can lead to a better adjustment, coordination and optimisation of innovation policies on all governance levels. This is especially attractive for Europe’s regions because, in times where RTDI budgets are stagnating, pooling funds and know-how in joint trans-regional projects can help to make the most efficient and effective use of regional resources and infrastructures. The CReATE project showed that, by conducting such forward-looking trans-regional activities, comprehensive knowledge and priority generation and its application are facilitated, trans-regional synergies are tapped, internationalisation of regional actors is enhanced and the basis for more economic success is established. The methodology followed a multi-actor, multi-level and multi-disciplinary approach, fostered trans-regional cooperation and thus promoted synergies between regional, national and European initiatives. 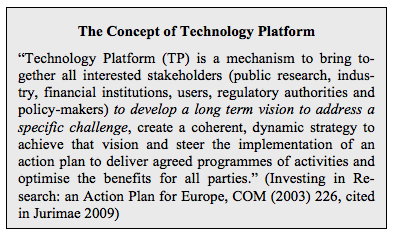 Similar to the ‘Strategic Research Agendas’ of the European Technology Platforms, the CReATE JRA can contribute to raising public and private RTDI investments at all governance levels and improve their impact through optimising efforts and resources. The dialogue-oriented CReATE methodology involved all relevant regional stakeholders of the ‘triple helix’ (university-industry-government) and thus facilitated consensus-building based on personal relationships and mutual trust. The CReATE activities can serve as a starting point for a comprehensive cluster foresight exercise to define a common vision and strategy for a broader approach to sustainable cluster development in the regions. The experiences of the regional CReATE activities show that participatory interactive approaches are a good way to set the scene for joint actions across different regions, sectors and disciplines. On the regional level, the stakeholder workshops have shown some barriers between the different business cultures, languages and mindsets between ICT and CI representatives. The challenge for innovation policies, for instance concerning cluster development, is to bridge the gap between these different mindsets and to leverage cross-disciplinary potential to boost innovation and competitiveness in new markets. The CReATE project’s regional stakeholder workshops clearly pointed out the need for specific support actions to optimally utilise the synergies between ICT and CI. The trans-regional JRA tapped trans-regional synergies by identifying specific regional needs and capabilities as well as the most promising international technology and market development perspectives. It provided the base for optimised concrete actions, both regionally and trans-regionally, generating a clear added value for the regions. The JRA enables all regional actors (from public to private sphere) to rethink and eventually to adjust the focus, effectiveness and efficiency of their policies and (business) strategies. A number of project ideas have already been developed among the project partners and will ensure a sustainable impact of the project after its finalisation. The CReATE methodology facilitated trans-regional and cross-cluster knowledge flows and learning processes across and beyond the CReATE regions and fostered the integration of the CReATE regions into international innovation networks. In this context, broadening and deepening the cross-regional activities beyond the project time frame is valuable to fully capitalise on the added value provided by this methodological approach.